Finally after visiting 34 countries I had opportunity to visit one of the must-see places in my own country. 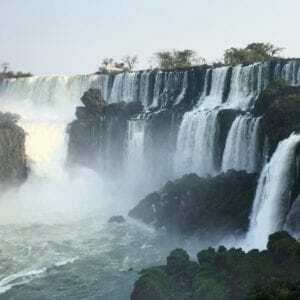 The thing is for us Brazilian Iguazu Falls is not on the top of our list. I know, it is one of the New Seven Wonders of Nature but people here prefer to go to Rio and enjoy summer in one of the thousand gorgeous beaches in the Northeast instead. There are plenty of flights to Foz do Iguaçu from Rio de Janeiro and Sao Paulo as well. It was a last minute trip so I decided to take a bus from São Paulo to Foz do Iguaçu a 15h ride, because last minute flights are all expensive. 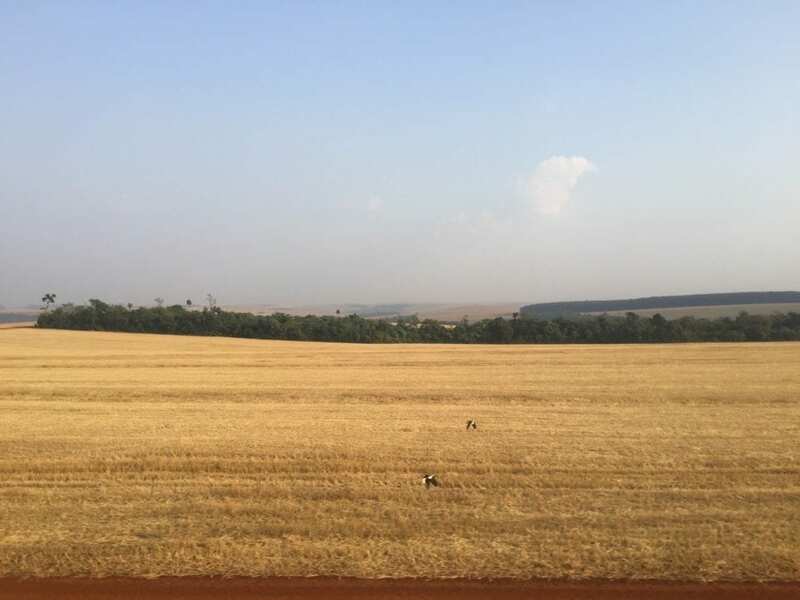 I left São Paulo in the end of the afternoon and in the morning I could appreciate the beautiful countryside of Paraná state dotted with wheat fields. I arrived at Foz do Iguaçu bus terminal completely lost and asked on the information desk about attractions and how to get around in the city. Foz do Iguaçu has around 260.000 inhabitants from 80 different nationalities and it’s one of the most cosmopolitan cities in Brazil. I took a bus and got off close by the small hotel that I saw online, but on my way I was intercepted by a tour guide who offered me a really good deal that I could not resist: something around US$15/night, for a private double room close to city center, with AC, hot shower and breakfast included. Deal! I just checked-in and left the hotel to wander around the city center. It was really hot 36C (97F), despite of the wintertime. Foz do Iguaçu has a small free zoo in the middle of the city, a Buddhist temple and a Mosque (which are not common in Brazil), close to the center. 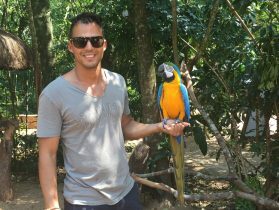 There is also a Wax Museum and a very interesting Bird’s Park, both on the way to the falls. The best thing is that they are all reachable by bus. On the next day I woke up early in the morning, had breakfast and headed to the falls. The Park offers really good infrastructure with parking lots, restaurants, restrooms, and is wheelchair accessible. Brazilians and Mercosul citizens have discount, but the price is truly fair (less than US$15). The only thing is the ticket is just to enter into the park and walk the 1200m path to the falls. All the other activities, even to hike by yourself in the rainforest, you have to pay extra and hire a guide, which pissed me off… From the entrance all the visitors have to take a bus, which stops in three different start point to hikes. I got off on the second one to take the 1200m path to the falls. The path goes into the rainforest, is easy to follow and offers spectacular views of the falls. There are some lookout points where you can stop to admire the fall’s natural splendor and take some good pictures. 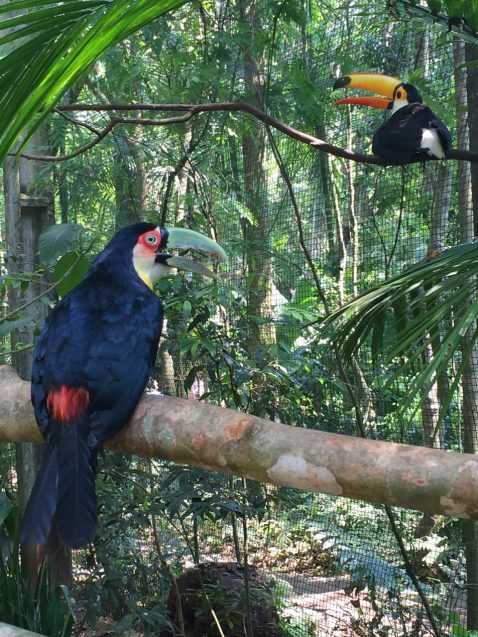 If you are lucky enough you can spot some toucans and exotic birds. The best views are when you get closer to the falls and can overlook its grandiosity. The finals meters of the path are along the canyon and lead you to the lower base of Devil’s Throat, an impressive section of the falls where 14 waterfalls runs into a narrow section 80m high. 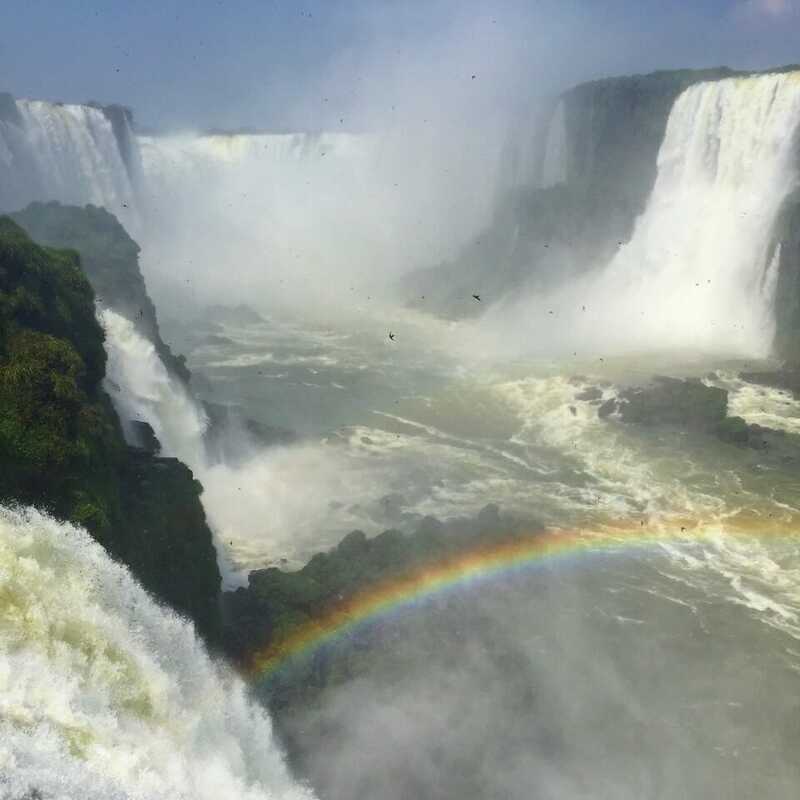 This was the most magical moment when I visited Iguazu Falls. I walked on the path facing massive crashing-waterfalls throwing water on me, a love-hate moment for many people, and got completely soaked and delighted. When I got into the ledge I was awestruck by the Devil’s Throat! It’s a jaw-dropping landscape, covered with permanent mist, teeming with birds flying crossing the falls and rainbows. The energy there is unique! 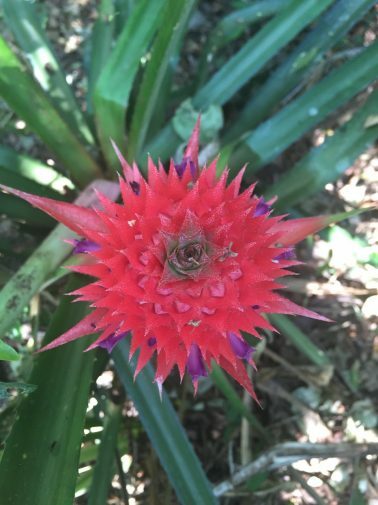 Iguazu National Park is situated in one of the few remaining rainforests in South America and has an abundant biodiversity with a plethora of plant species, birds, mammals, insects and invertebrates. 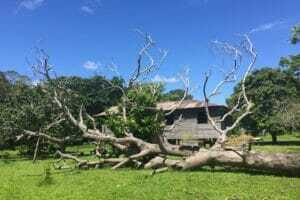 So, in the afternoon I decide to take a guided tour on the forest to get to know a little more about this scarce environment, and get some adventure. The Macuco Safari tour started with an electrical cart ride into the Atlantic Forest, where the guide explained about the fauna and flora of the Park and then a 20min walk along the trail until the dock to take the boat. On the dock I took of my shoes, put my life vest on and seat in the front of the inflatable boat designed exclusively for the needs of this route. The speedboat goes up the Paraná River and I felt the adrenaline running through my veins. The boat made one stop for pictures and started to run again towards the falls. As we got closer we started to scream our heads off until we get the “waterfall bath”. 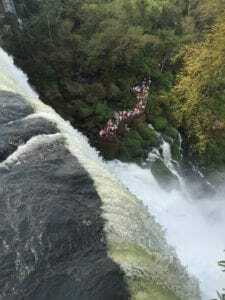 In some moments I couldn’t see anything, just felt the impact of thousands of liters of water pouring down on my body and heard the strong roar of the falls. I felt like a child! Everyone got completely soaked and cheerful. The boat left the Three Muskets Fall, the climax of the ride and took the way back to the dock. But we were so happy and laughing out loud, that the captain decided to go back to the falls. We got so exhilarant and started to scream even more. The vessel approached to the falls, and the water was coming down on my back, shoulders and head; I screamed a lot and had a blast time. The felling of being literally under one of the falls was terrific. On the way back the captain was driving in zig-zag, and we were screaming, giggling again, and getting even more soaked… The boat ride was the best thing I did when I visited Iguazu Falls. From Foz do Iguaçu I took a bus to Puerto Iguazu, where the Iguazu Falls is located on the Argentinian side. Actually there is a tri-border area known as triple frontier among Foz do Iguaçu (Brazil), Puerto Iguazu (Argentina) and Cidad del Elste (Paraguay). 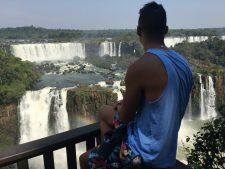 I got off on Puerto Iguazu’s bus terminal and then I had some troubles. The first was the local bus only accepted Argentinian currency, secondly I tried two different ATM’s from different banks and my card didn’t work, luckily I finally found a third one, Banco de la Nacion, and it worked out. The other thing was the entrance to the Park must be paid only in Argentinian Pesos, no cards and nor other currencies… I wasted a lot of time, almost changed my mind and went back to Brazil because I didn’t have enough Brazilian Reais to exchange for Pesos. The bus ride was around 30min and I just arrived in the park after noon. From the entrance I realized that the Park was completely different from the Brazilian side. There is an old train that takes everyone from the Central Station to Cataratas Station and from there you can take the lower path, the upper path, or another train to Devil’s throat. You can also do a hike in the forest by yourself or even walk all the way instead of taking the trains. And the best is all those hikes are free despite of the Brazilian side that you have to pay for it. 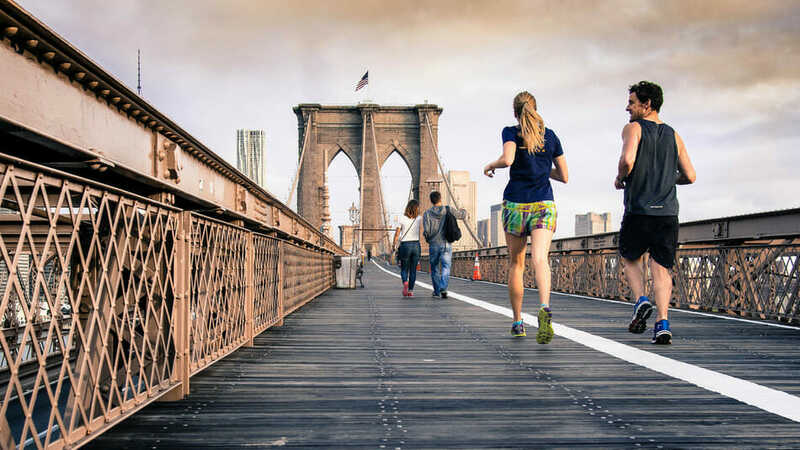 The boat ride can also be done in the Argentinian side and it costs less than half price of the Brazilian side, the difference is that you walk some steps instead of taking an electrical cart. With 80% of the Park comprised In Argentina, is important to arrive early in the morning to do all the hikes and get the most out of your visit. I took the train straight to Devil’s Throat, and yet this part of the falls is magnificent, whether in the Brazilian or Argentinian side. Furthermore both sides provide different perspectives. From there I walked back to Cataratas Station and took the upper path first, which is 1,750m and took me around 30min. 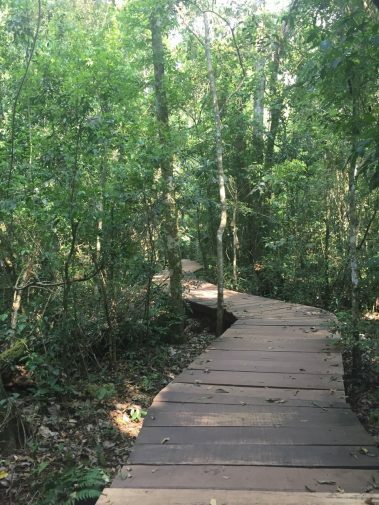 Part of the path is in the middle of the rain forest and others are very close to the falls portraying a panoramic view of it in both countries. The lower path has almost the same length but offers a much better view!! 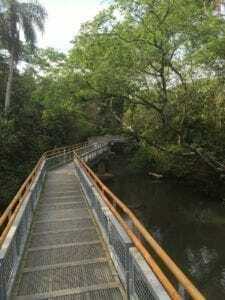 Footbridges go into the forest foliage and in some points there are stairs to access lower platforms where one can get closer to the falls and admire its magnificence. From the lower path you can also board a boat to visit San Martin Island (only during the summer) and access the Macuco Trail, the Argentinian version of the boat ride toward the falls. 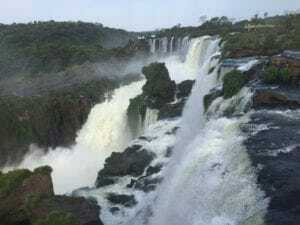 The visit of Iguazu Falls Argentina was totally worthwhile and it should not be missed! Iguazu Waterfalls should be in everyone’s list when visiting South America. 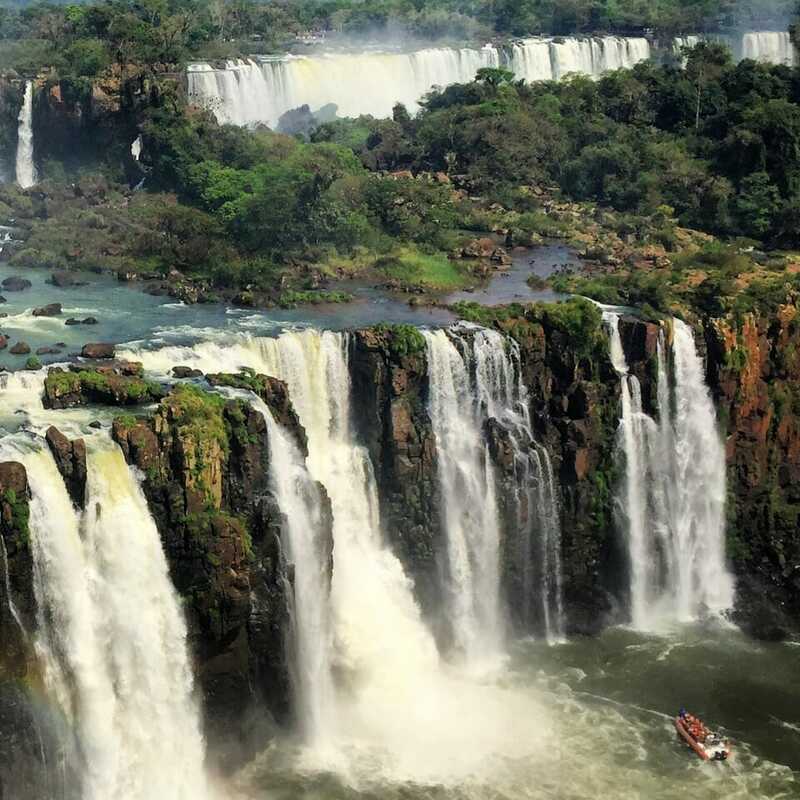 With 19 main falls varying between 40 to 80 meters, Iguazu National Park is situated on the border of Brazil and Argentina, and visitors should program at least one day for each side to enjoy this dramatic landscape with splendid falls. 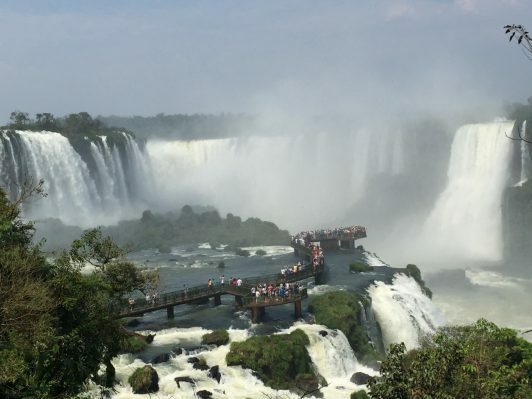 If you like an extra dose of adventure, the boat ride into Iguazu Falls can take your breath away. 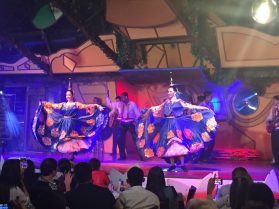 There are also other attractions to please everyone, such as: a Bird’s Park (highly recommendable), a Wax Museum, a Mosque, a Buddhist Temple, Dinner shows and Itaipu Dam in Foz do Iguaçu (Brazil); a Craft Mark, an Ice bar and a Duty Free in Puerto Iguazu (Argentina). 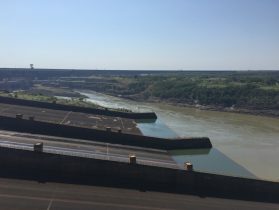 Itaipu Dam. I don’t think it worth to visit. The show is much better than the food. 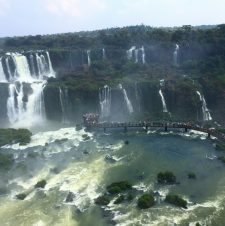 Because the Iguazu National Park is located between Brazil and Argentina, there are two options when you visit Iguazu Falls: Foz do Iguaçu (Brazil) and Puerto Iguazu (Argentina). Check map here. I’ve wanted to visit Iguazu Falls for as long as I can remember. It’s interesting that Brazil charges for practically everything being that they only have 20% of the park. 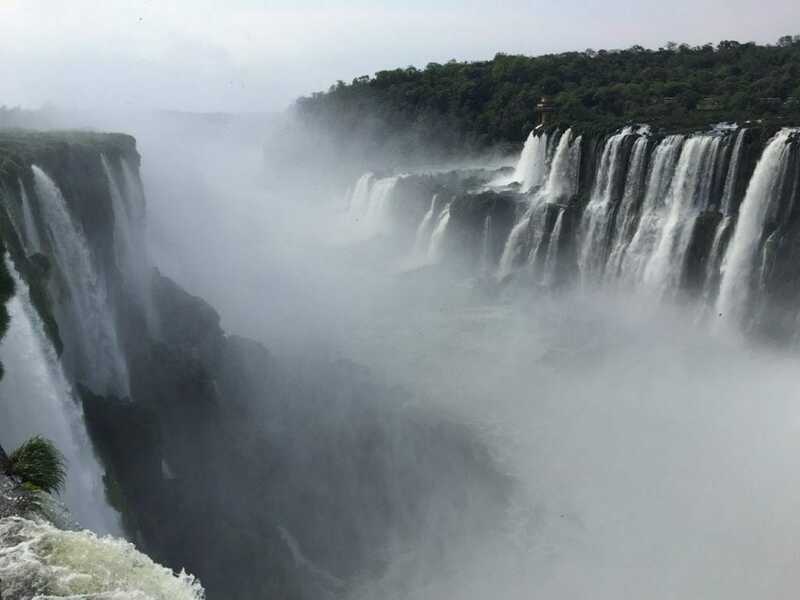 It seems as though it would be best to go to Brazil to see it from that side and then go to Argentina to enjoy anything else in the park and related to the falls. The Brazilian side seems like how Niagara Falls is over here in the states. I lived in NY for four years and never made my way to Niagara. Such a shame!! If you wanna extend your stay in Argentina you can go to Buenos Aires which is a really nice city.